Double LP version. 180 gram pressing, gatefold sleeve. The Modern Jazz Quartet's 1957 Cologne, Gurzenich Concert Hall is an original master concert recording from November 6, 1957, recorded at Gürzenich Concert Hall in Cologne. Previously unreleased, it was retrospectively released for the first time in 2010. Another release in WDR's The Cologne Broadcasts series, it was mastered by Thomas Sehringer. Both formats include musician and composer credits, plus liner notes by journalist and radio host Karsten Mützelfeldt in English and German. The Modern Jazz Quartet (MJQ) was a jazz combo established in 1952 that played music influenced by classical, cool jazz, blues and bebop. For most of its history the Quartet consisted of John Lewis (piano), Milt Jackson (vibraphone), Percy Heath (double bass), and Connie Kay (drums). The group grew out of the rhythm section of Dizzy Gillespie's big band from 1946 to 1948, which consisted of Lewis and Jackson along with bassist Ray Brown and drummer Kenny Clarke. The Modern Jazz Quartet's 1957 Cologne, Gurzenich Concert Hall is an original master concert recording from November 6, 1957, recorded at Gürzenich Concert Hall in Cologne. Previously unreleased, it was retrospectively released for the first time in 2010. Another release in WDR's The Cologne Broadcasts series, it was mastered by Thomas Sehringer. Both formats include musician and composer credits, plus liner notes by journalist and radio host Karsten Mützelfeldt in English and German. The Modern Jazz Quartet (MJQ) was a jazz combo established in 1952 that played music influenced by classical, cool jazz, blues and bebop. For most of its history the Quartet consisted of John Lewis (piano), Milt Jackson (vibraphone), Percy Heath (double bass), and Connie Kay (drums). The group grew out of the rhythm section of Dizzy Gillespie's big band from 1946 to 1948, which consisted of Lewis and Jackson along with bassist Ray Brown and drummer Kenny Clarke. CD version in slipcase with eight page booklet. Two legends met to perform at the Philharmonie, Cologne on May 20th and 21st 1988 for a release in the WDR The Cologne Broadcasts series. Both musicians knew each other longtime from way back during World War II; as teenagers, Friedrich Gulda and his friend Joe Zawinul would go out and perform forbidden musics, like jazz, in violation of the Nazi government's prohibition on the playing of such music. Includes a composition by Johannes Brahms. Music For Two Pianos includes musician and composer credits, plus liner notes and self-portraits by Friedrich Gulda and Joe Zawinul in English, French, and German. Personnel: Friedrich Gulda - Piano; Joe Zawinul - Piano; WDR Big Band plays on "Variations For Two Pianos And Band". CD version comes in a slipcase. LP version. 180 gram vinyl; gatefold sleeve. Double LP version. 180 gram vinyl; gatefold sleeve. Live In Cologne 1970 by the Oscar Peterson Trio is an original master concert recording from the 19th of November in 1970 at the Gürzenich Concert Hall, Cologne. The same short lived trio that recorded the studio albums Another Day (1971) and Walking The Line (1970) for the MPS Records/BASF labels was back in Cologne six days later for a live performance that leaves no doubt that Oscar Peterson was at the height of his technical skills, the virtuosity of the pianist even more remarkable. Live In Cologne 1970 was previously unreleased until being retrospectively released for the first time in 2015. Another release in WDR's The Cologne Broadcasts series, it was executively produced by Bernd Hoffmann, recorded by M. Weyer, mastered by Thomas Sehringer, with the vinyl cut by John Cremer. Includes musician and composer credits, plus liner notes by journalist and radio host Karsten Mützelfeldt in English and German. Personnel: Oscar Peterson - piano; George Mraz - bass; Ray Price - drums. Live In Cologne 1970 by the Oscar Peterson Trio is an original master concert recording from the 19th of November in 1970 at the Gürzenich Concert Hall, Cologne. The same short lived trio that recorded the studio albums Another Day (1971) and Walking The Line (1970) for the MPS Records/BASF labels was back in Cologne six days later for a live performance that leaves no doubt that Oscar Peterson was at the height of his technical skills, the virtuosity of the pianist even more remarkable. Live In Cologne 1970 was previously unreleased until being retrospectively released for the first time in 2015. Another release in WDR's The Cologne Broadcasts series, it was executively produced by Bernd Hoffmann, recorded by M. Weyer, mastered by Thomas Sehringer, with the vinyl cut by John Cremer. Includes musician and composer credits, plus liner notes by journalist and radio host Karsten Mützelfeldt in English and German. Personnel: Oscar Peterson - piano; George Mraz - bass; Ray Price - drums. In slipcase with eight-page booklet. 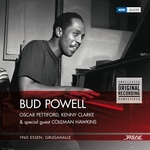 Bud Powell's 1960 Essen, Grugahalle is an original master concert recording recorded at the Essen Jazzfestival. It was unreleased until being retrospectively released for the first time in 2010. Another release in WDR's The Cologne Broadcasts series, it was executively produced by Manfred Niehaus and mastered by Thomas Sehringer; the vinyl was cut by Daniel Krieger. Includes musician and composer credits, plus liner notes by journalist and radio host Karsten Mützelfeldt in English and German. Personnel: Bud Powell - piano; Oscar Pettiford - bass; Kenny Clarke - drums; Coleman Hawkins - tenor saxophone. In slip case with four page booklet. LP version. 180 gram vinyl; gatefold sleeve. 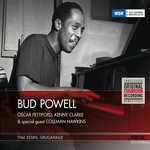 Bud Powell's 1960 Essen, Grugahalle is an original master concert recording recorded at the Essen Jazzfestival. It was unreleased until being retrospectively released for the first time in 2010. Another release in WDR's The Cologne Broadcasts series, it was executively produced by Manfred Niehaus and mastered by Thomas Sehringer; the vinyl was cut by Daniel Krieger. Includes musician and composer credits, plus liner notes by journalist and radio host Karsten Mützelfeldt in English and German. Personnel: Bud Powell - piano; Oscar Pettiford - bass; Kenny Clarke - drums; Coleman Hawkins - tenor saxophone. Cannonball Adderley Quintet/Benny Carter Sextet's Live In Cologne 1961 is an original master concert recording from the 16th of April, 1961, recorded at the Gürzenich Concert Hall and on the 27th of November 1961 at WDR's studio with recording engineer Hagen Galatis and musicians of the Kurt Edelhagen Orchestra. It was unreleased until being retrospectively released for the first time in 2015. Another release in WDR's The Cologne Broadcasts series, it was executively produced by Bernd Hoffmann, mastered for CD by Thomas Sehringer and for vinyl by John Cremer. Includes musician and composer credits, plus liner notes by journalist and radio host Karsten Mützelfeldt in English and German. Personnel: Cannonball Adderley Quintet: Cannonball Adderley - alto saxophone; Nat Adderley - cornet; Sam Jones - bass; Louis Hayes - drums; Victor Feldman - piano/vibraphone. Benny Carter Sextet: Benny Carter - alto saxophone; Karl Drewo - tenor saxophone; Raymond Droz - trombone; Francis Coppieters - piano; Eric Peter - bass; Stuff Combe - drums. CD version in slipcase, includes eight-page booklet. LP version. 180 gram vinyl; gatefold sleeve. 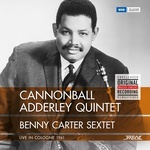 Cannonball Adderley Quintet/Benny Carter Sextet's Live In Cologne 1961 is an original master concert recording from the 16th of April, 1961, recorded at the Gürzenich Concert Hall and on the 27th of November 1961 at WDR's studio with recording engineer Hagen Galatis and musicians of the Kurt Edelhagen Orchestra. It was unreleased until being retrospectively released for the first time in 2015. Another release in WDR's The Cologne Broadcasts series, it was executively produced by Bernd Hoffmann, mastered for CD by Thomas Sehringer and for vinyl by John Cremer. Includes musician and composer credits, plus liner notes by journalist and radio host Karsten Mützelfeldt in English and German. Personnel: Cannonball Adderley Quintet: Cannonball Adderley - alto saxophone; Nat Adderley - cornet; Sam Jones - bass; Louis Hayes - drums; Victor Feldman - piano/vibraphone. Benny Carter Sextet: Benny Carter - alto saxophone; Karl Drewo - tenor saxophone; Raymond Droz - trombone; Francis Coppieters - piano; Eric Peter - bass; Stuff Combe - drums. Double LP version. 180 gram vinyl; gatefold sleeve. 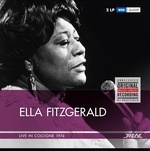 Ella Fitzgerald's Live In Cologne 1974 is an original master concert recording from February 27, 1974 at the Sporthalle, Cologne. It was unreleased until being retrospectively released for the first time in 2016. Another release in WDR's The Cologne Broadcasts series, it was executively produced by Bernd Hoffmann, mastered by Dirk Franken with the vinyl cut by John Cremer. It includes musician and composer credits, plus liner notes by journalist and radio host Karsten Mützelfeldt in English and German. Personnel: Ella Fitzgerald - vocals; Tommy Flanagan - piano; Joe Pass - guitar; Keter Betts - bass; Bobby Durham - drums; Roy Eldridge - trumpet (11, 12); Eddie "Lockjaw" Davis - tenor saxophone (11, 12). Ella Fitzgerald's Live In Cologne 1974 is an original master concert recording from February 27, 1974 at the Sporthalle, Cologne. It was unreleased until being retrospectively released for the first time in 2016. Another release in WDR's The Cologne Broadcasts series, it was executively produced by Bernd Hoffmann, mastered by Dirk Franken with the vinyl cut by John Cremer. It includes musician and composer credits, plus liner notes by journalist and radio host Karsten Mützelfeldt in English and German. Personnel: Ella Fitzgerald - vocals; Tommy Flanagan - piano; Joe Pass - guitar; Keter Betts - bass; Bobby Durham - drums; Roy Eldridge - trumpet (11, 12); Eddie "Lockjaw" Davis - tenor saxophone (11, 12). CD version in slipcase with eight-page booklet. Double LP version. 180 gram vinyl; gatefold sleeve. Live In Cologne 1963 by the Oscar Peterson Trio is an original master concert recording from April 27, 1963 at the Gürzenich Concert Hall in Cologne. It was retrospectively released for the first time in 2010. Another release in WDR's The Cologne Broadcasts series, it was executively produced by Bernd Hoffmann, engineered by M. Weyer, mastered by Thomas Sehringer, vinyl cut by John Cremer. Includes musician and composer credits, plus liner notes by journalist and radio host Karsten Mützelfeldt in English and German. Personnel: Oscar Peterson - piano; Ray Brown - bass; Ed Thigpen - drums. 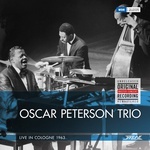 Live In Cologne 1963 by the Oscar Peterson Trio is an original master concert recording from April 27, 1963 at the Gürzenich Concert Hall in Cologne. It was retrospectively released for the first time in 2010. Another release in WDR's The Cologne Broadcasts series, it was executively produced by Bernd Hoffmann, engineered by M. Weyer, mastered by Thomas Sehringer, vinyl cut by John Cremer. Includes musician and composer credits, plus liner notes by journalist and radio host Karsten Mützelfeldt in English and German. Personnel: Oscar Peterson - piano; Ray Brown - bass; Ed Thigpen - drums. In slipcase, includes eight-page booklet. Live In Dusseldorf 1960 by the Stan Getz Quartet is an original master concert recording from March 28th, 1960, recorded at the Rheinhalle in Düsseldorf, Germany. Previously unreleased, it was retrospectively released for the first time in 2014. Another release in WDR's The Cologne Broadcasts series, it was executively produced by Franz-Josef Schwarz and mastered by Dirk Franken. The current release includes musician credits and liner notes by journalist and radio host Karsten Mützelfeldt in English and German. Stan Getz, born Stanley Gayetski (February 2, 1927-June 6, 1991) was an American jazz saxophonist. Playing primarily the tenor saxophone, Getz was known as "The Sound" because of his warm, lyrical tone, his prime influence being the wispy, mellow timbre of his idol, Lester Young. Coming to prominence in the late 1940s with Woody Herman's big band, Getz is described by critic Scott Yanow as "one of the all-time great tenor saxophonists." Personnel: Stan Getz - tenor saxophone; Ray Brown - bass; Ed Thigpen - drums; Jan Johansson - piano. In slipcase with eight-page booklet. LP version. 180 gram vinyl; gatefold sleeve. Live In Dusseldorf 1960 by the Stan Getz Quartet is an original master concert recording from March 28th, 1960, recorded at the Rheinhalle in Düsseldorf, Germany. Previously unreleased, it was retrospectively released for the first time in 2014. Another release in WDR's The Cologne Broadcasts series, it was executively produced by Franz-Josef Schwarz and mastered by Dirk Franken. The current release includes musician credits and liner notes by journalist and radio host Karsten Mützelfeldt in English and German. Stan Getz, born Stanley Gayetski (February 2, 1927-June 6, 1991) was an American jazz saxophonist. Playing primarily the tenor saxophone, Getz was known as "The Sound" because of his warm, lyrical tone, his prime influence being the wispy, mellow timbre of his idol, Lester Young. Coming to prominence in the late 1940s with Woody Herman's big band, Getz is described by critic Scott Yanow as "one of the all-time great tenor saxophonists." Personnel: Stan Getz - tenor saxophone; Ray Brown - bass; Ed Thigpen - drums; Jan Johansson - piano. Double LP version, gatefold sleeve. The Modern Jazz Quartet's 1959 Bonn, Beethovenhalle is an original master concert recording from the Beethovenhalle, in Bonn, Germany, previously retrospectively released for the first time in 2010. A release in WDR's The Cologne Broadcasts series, it was executively produced by Franz-Josef Schwarz and mastered by Thomas Sehringer. Both formats include musician and composer credits, plus liner notes by journalist and radio host Karsten Mützelfeldt in English and German. The Modern Jazz Quartet (MJQ) was a jazz combo established in 1952 that played music influenced by classical, cool jazz, blues, and bebop. For most of its history the Quartet consisted of John Lewis (piano), Milt Jackson (vibraphone), Percy Heath (double bass), and Connie Kay (drums). The group grew out of the rhythm section of Dizzy Gillespie's big band from 1946 to 1948, which consisted of Lewis and Jackson along with bassist Ray Brown and drummer Kenny Clarke. The Modern Jazz Quartet's 1959 Bonn, Beethovenhalle is an original master concert recording from the Beethovenhalle, in Bonn, Germany, previously retrospectively released for the first time in 2010. A release in WDR's The Cologne Broadcasts series, it was executively produced by Franz-Josef Schwarz and mastered by Thomas Sehringer. Both formats include musician and composer credits, plus liner notes by journalist and radio host Karsten Mützelfeldt in English and German. The Modern Jazz Quartet (MJQ) was a jazz combo established in 1952 that played music influenced by classical, cool jazz, blues, and bebop. For most of its history the Quartet consisted of John Lewis (piano), Milt Jackson (vibraphone), Percy Heath (double bass), and Connie Kay (drums). The group grew out of the rhythm section of Dizzy Gillespie's big band from 1946 to 1948, which consisted of Lewis and Jackson along with bassist Ray Brown and drummer Kenny Clarke. Slipcase with four-page booklet. 1960 Essen, Grugahalle by The Dave Brubeck Quartet is an original master concert recording from the 2nd of April, 1960 at the Grugahall, Essen. It was retrospectively released for the first time in 2010. Another release in WDR's The Cologne Broadcasts series, it was executively produced by Manfred Niehaus and mastered by Thomas Sehringer. Both formats include musician and composer credits, plus liner notes by journalist and radio host Karsten Mützelfeldt in English and German. Personnel: Dave Brubeck - piano; Paul Desmond - saxophone; Gene Wright (aka Eugene Wright) - bass; Joe Morello - drums. In slipcase with four-page booklet. LP version; gatefold sleeve, 180 gram vinyl. 1960 Essen, Grugahalle by The Dave Brubeck Quartet is an original master concert recording from the 2nd of April, 1960 at the Grugahall, Essen. It was retrospectively released for the first time in 2010. Another release in WDR's The Cologne Broadcasts series, it was executively produced by Manfred Niehaus and mastered by Thomas Sehringer. Both formats include musician and composer credits, plus liner notes by journalist and radio host Karsten Mützelfeldt in English and German. Personnel: Dave Brubeck - piano; Paul Desmond - saxophone; Gene Wright (aka Eugene Wright) - bass; Joe Morello - drums. Live In Berlin 1961/Live In Essen 1959 by Thelonious Monk Quartet/Martial Solal Trio, is original master concert recordings from the 22nd of May, 1961 at Deutsche Jazz Salon, Berlin, and April 18th, 1959 at Grugahalle, Essen. Both sessions were retrospectively released for the first time in 2012. This is release is another in WDR's The Cologne Broadcasts series, produced by Rolf-Dieter Weyer, Manfred Niehaus, and Franz-Josef Schwarz and mastered by Thomas Sehringer. Both formats include musician and composer credits, plus liner notes by journalist and radio host Karsten Mützelfeldt in English and German. Personnel: Thelonious Monk Quartet: Thelonious Monk - piano; Charlie Rouse - tenor saxophone; John Ore - bass; Frankie Dunlop - drums. Martial Solal Trio: Martial Solal - piano; Oscar Pettiford - bass; Kenny Clarke - drums; Lucky Thompson - soprano saxophone ("The World Awakes" and "Yesterdays"). In slipcase with eight-page booklet. LP version. 180 gram vinyl; gatefold sleeve. Live In Berlin 1961/Live In Essen 1959 by Thelonious Monk Quartet/Martial Solal Trio, is original master concert recordings from the 22nd of May, 1961 at Deutsche Jazz Salon, Berlin, and April 18th, 1959 at Grugahalle, Essen. Both sessions were retrospectively released for the first time in 2012. This is release is another in WDR's The Cologne Broadcasts series, produced by Rolf-Dieter Weyer, Manfred Niehaus, and Franz-Josef Schwarz and mastered by Thomas Sehringer. Both formats include musician and composer credits, plus liner notes by journalist and radio host Karsten Mützelfeldt in English and German. Personnel: Thelonious Monk Quartet: Thelonious Monk - piano; Charlie Rouse - tenor saxophone; John Ore - bass; Frankie Dunlop - drums. Martial Solal Trio: Martial Solal - piano; Oscar Pettiford - bass; Kenny Clarke - drums; Lucky Thompson - soprano saxophone ("The World Awakes" and "Yesterdays"). Blues at Onkel Pö's Carnegie Hall. Louisiana Red was one of the most famous blues guitarists, known for his unique style. By the way, the stage name "Louisiana Red" (there have been other names as well) refers to a hot sauce customary in the delta-state of Mississippi. 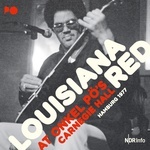 Customary, just as the extremely archaic blues of which Louisiana Red has always been a paradigmatic representative; this was also the case on that particular evening in June 1977, when he, the blues import from across the Atlantic, was alone on stage of "Onkel Pö's Carnegie Hall" in Hamburg-Eppendorf, accompanied only by his guitar and his mouth-organ. This legendary concert is one of the highlights of the Onkel Pö series. Recorded on June 14, 1977 at Onkel Pö's Carnegie Hall, Hamburg, Germany; Recorded by NDR Hamburg. Features extended liner notes in English and German by Michael Laages. Double-CD version includes 12-page booklet. Double LP version. 180 gram vinyl; gatefold sleeve. Blues at Onkel Pö's Carnegie Hall. Louisiana Red was one of the most famous blues guitarists, known for his unique style. By the way, the stage name "Louisiana Red" (there have been other names as well) refers to a hot sauce customary in the delta-state of Mississippi. Customary, just as the extremely archaic blues of which Louisiana Red has always been a paradigmatic representative; this was also the case on that particular evening in June 1977, when he, the blues import from across the Atlantic, was alone on stage of "Onkel Pö's Carnegie Hall" in Hamburg-Eppendorf, accompanied only by his guitar and his mouth-organ. This legendary concert is one of the highlights of the Onkel Pö series. Recorded on June 14, 1977 at Onkel Pö's Carnegie Hall, Hamburg, Germany; Recorded by NDR Hamburg. Features extended liner notes in English and German by Michael Laages. Double-LP version. 180 gram vinyl; Gatefold sleeve. 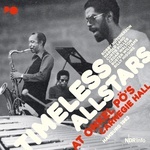 Initially, the name Timeless Allstars was meant literally -- the music produced by this ensemble should be timeless -- one should be able to listen to it again and again throughout the years, independently from the prevailing zeitgeist. All the artists who came together to form this artist name have proven -- over decades in different bands -- that they were masters of the "mainstream"-sound of jazz: the saxophonist Harold Land, the trombonist Curtis Fuller, and Bobby Hutcherson on the vibraphone; they were accompanied by a rhythm section which was always more than just that -- with Cedar Walton at the piano, the bassist Buster Williams, and Billy Higgins, one of the most outstanding drummers of jazz. The title is absolutely right: they were "All Stars" -- true masters in their respective fields. Personnel: Curtis Fuller - trombone; Harold Land - tenor saxophone; Cedar Walton - piano; Bobby Hutcherson - vibraphone; Buster Williams - bass; Billy Higggins - drums. Recorded April 5, 1982 at Onkel Pö's Carnegie Hall, Hamburg, Germany; Recorded by NDR Hamburg. Features extended liner notes in English and German by Michael Laages.